February is a cruel, angry month. There are few things in it that are worth looking forward to unless you are one of those people who loves snow and cold. That is until you remember that it is the beginning of the Pied de Cochon Cabane a Sucre season. 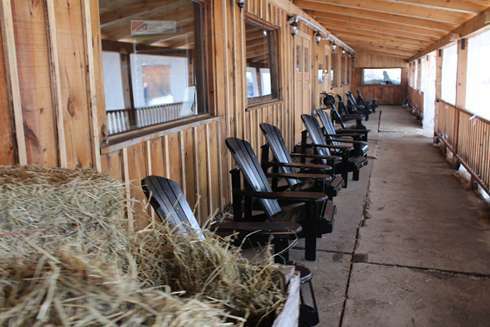 This year the season at the cabane goes on from February 14th until May 10th. We were fortunate enough to get an early spot and like every year people came down from as far as Toronto for this event. Now, if you have never been, the Pied de Cochon Cabane a sucre has a fixed menu with an avalanche of food. There is a fixed price of $62 before taxes and tip. It does not include drinks. 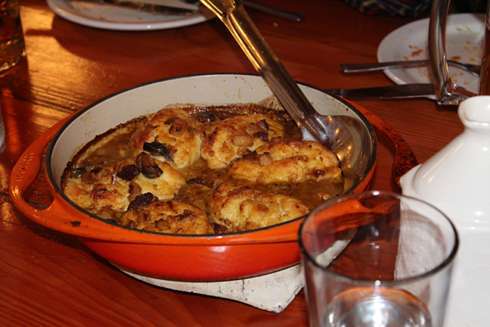 There are multiple dishes – each unique and inspired by maple and some traditional Quebec Cabane a sucre dishes (which kind of involve maple anyways). We started off with a few drinks, as always. 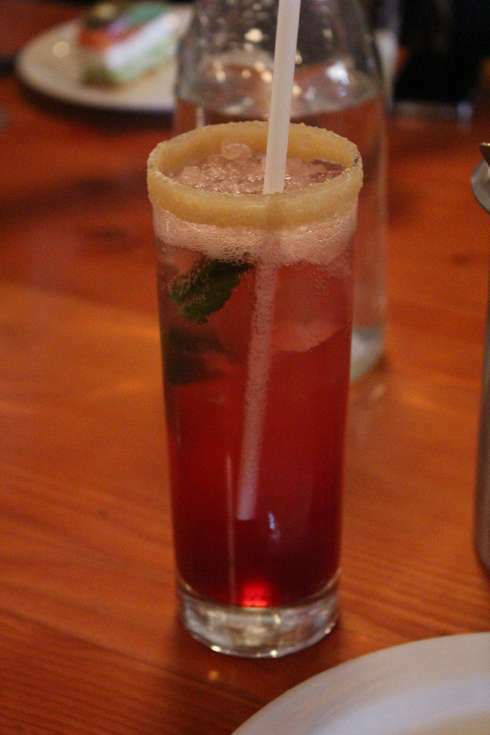 They have a few maple inspired ones and some classic drinks as well. 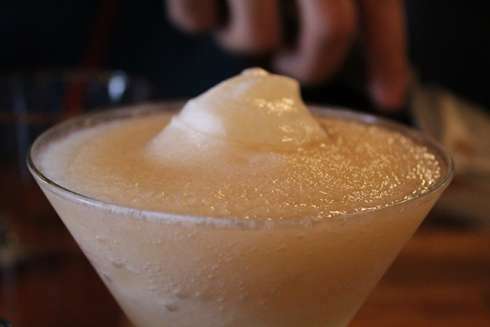 You can get beer, mimosa, daiquiris and an alcoholic coffee with cognac maple and almond cream. Once the liquid nutrition was done we moved towards the more substantive part of the service… the food. 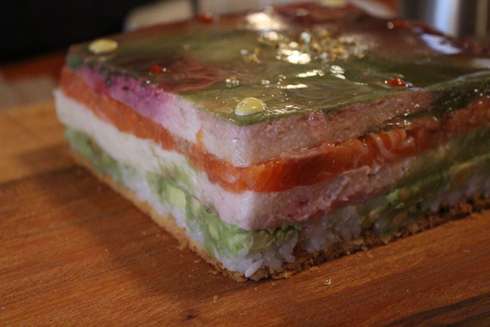 The first service was a sushi slab which, literally, is a giant square sushi made up of salmon, avocado, beet puree and beet jelly. I remember having sushi at the cabane a couple years ago and was very excited to see it come back. The salmon was incredible and everything worked perfectly with this dish. I also like seeing fish on their menu since it tends to be meat focused often and in my books they always do a great job on fish that, I feel, gets overlooked. 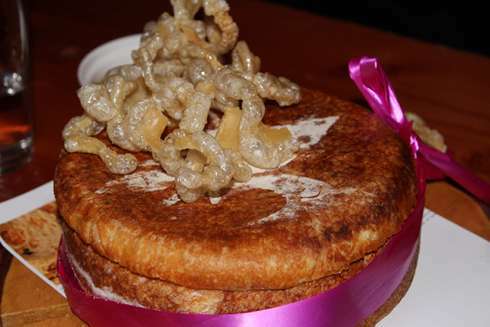 This was followed up with a bread which had its top opened up and stuffed with foie gras, and topped with the signature Pied de Cochon pork Pork rinds done in an light fluffy way reminiscent of tempura. 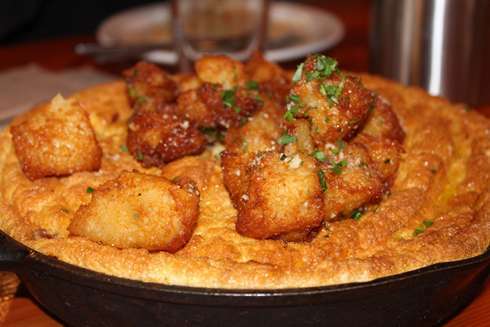 There was also a soufflé omelette with chorizo and garlic potatoes on top. This dish also came with a side of baked beans that are the must-have for any sugar shack if this is your first time. 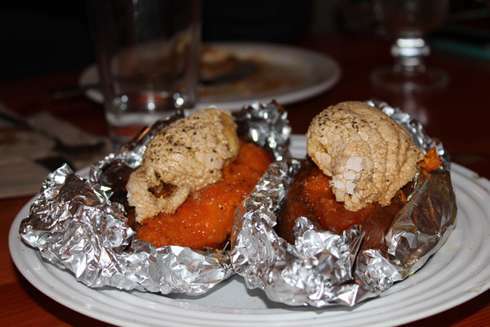 There was also a Sturgeon Quenelle which was a hit with everyone at the table. Once again, having seafood on the menu is always a big plus with us. 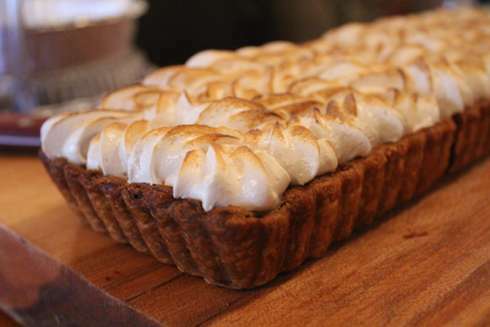 There was a side of sweet potatoes and marshmallow maple topping. This dish was is odd when you think about it but the tastes work well together and makes for a surprisingly tasty experience and incredibly creative dish. 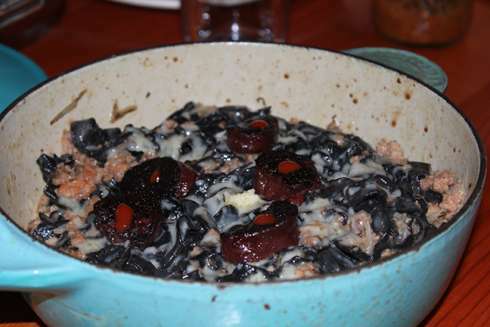 The squid ink pasta with blood pudding was tasty. As a pasta fan, I like seeing it and I went for seconds on this one. 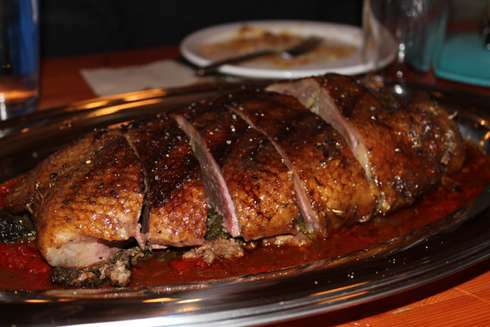 The most impressive dish was the duck confit which, was enormous. The slices were meaty and generous. They even lit it on fire in front of you for that extra over-the-top affect. If you somehow were not full before this, then, you were definitely full after it. It was so good some of us even went straight to the fat with minimal shame in our eyes. 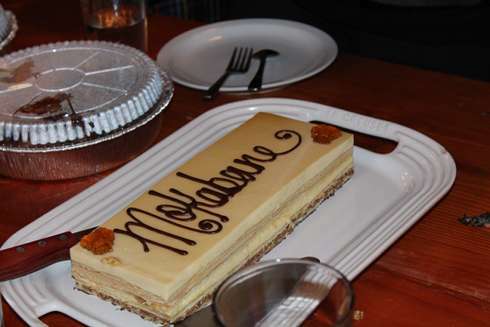 Lastly, came the sweet stuff: dessert, and it was an impressive showing. With a layered cake to begin with that looked almost as good as it tasted and, trust me, it looked really good so you can imagine the taste. 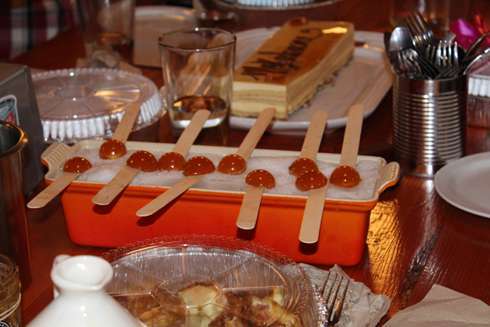 There was also maple syrup taffy on a stick done ever-so-perfectly in circles giving that traditional sugar shack experience with fancy presentations. An incredible frozen yogourt with maple flavour, that is to die, for and a kind of banana bread dessert was the star of these 4 dishes. Which is quite difficult considering each is a star in their own right. 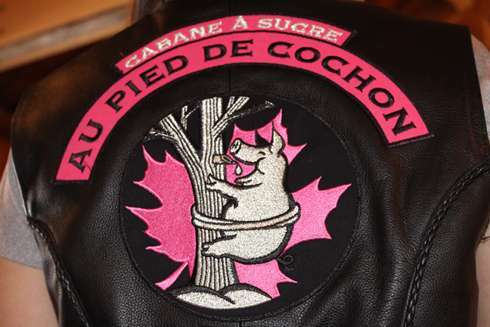 So, that’s it for the 2014 Pied de Cochon cabane a sucre review. We love it every year, and look forward to next year’s to see the new additions. 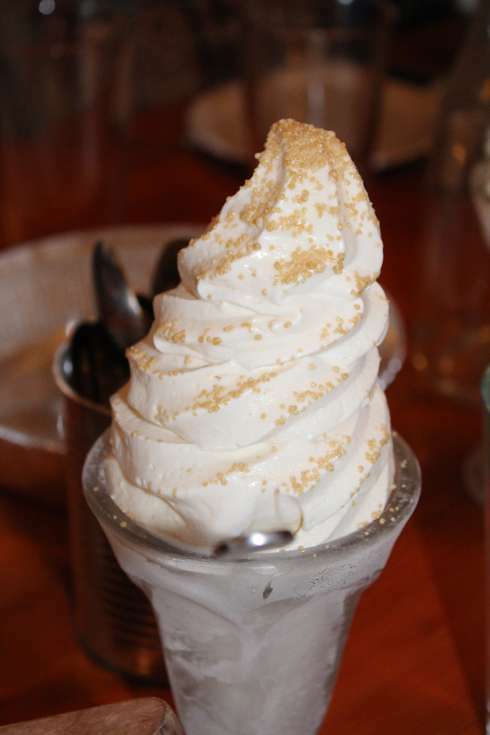 You can see our older reviews here to see the evolution and changes in dishes. Why did we get sliced ham and not that damn sturgeon business …. WHY SENSEI????? We got both the sliced ham and the damn sturgeon business.